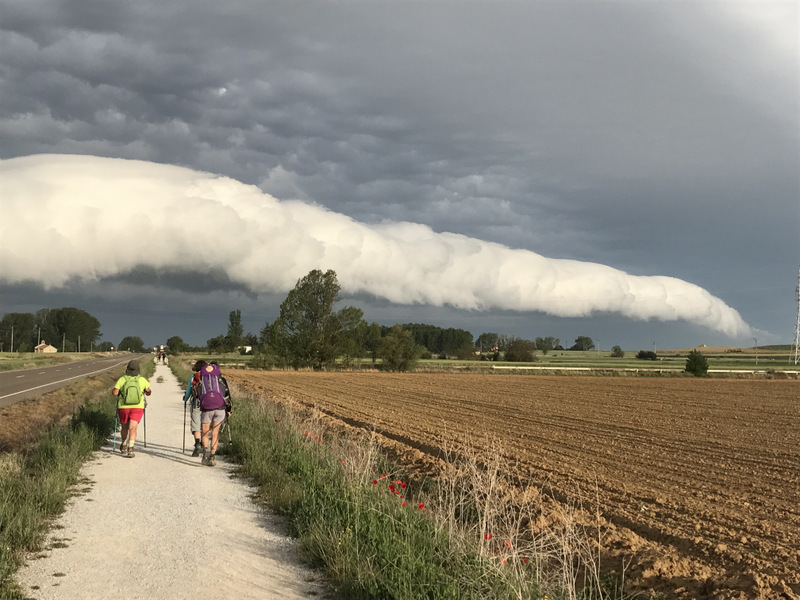 What better way to see Spain than a 900-kilometre walk right across it in one go, covering five exotic provinces, starting from St Jean in France and finishing at Finesterre on the Atlantic by way of Santiago? 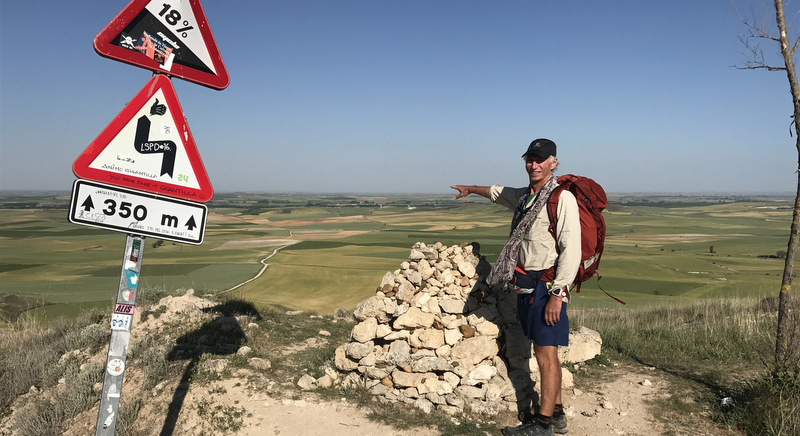 I am referring to the Camino de Frances, The Way of St James or the Camino de Santiago, as it is variously referred to. Camino is Spanish for path. 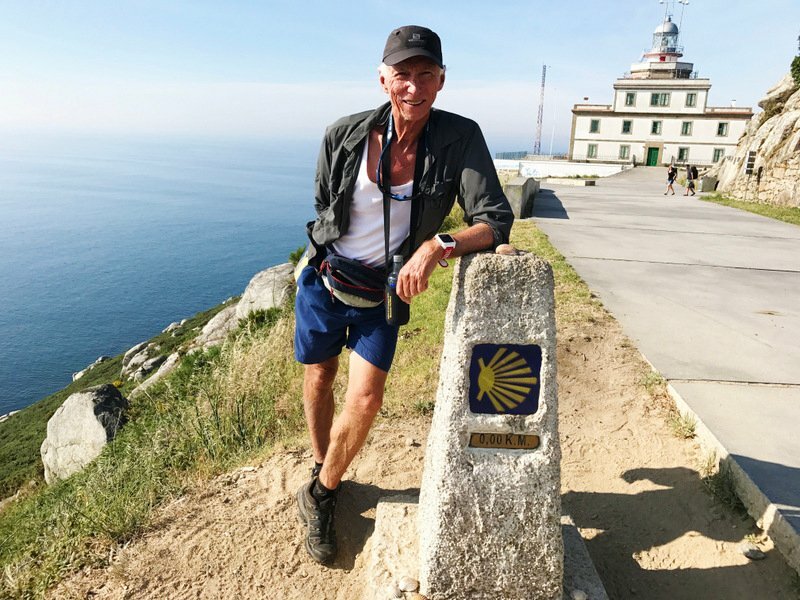 Phuket expat Harry Usher points to the way ahead on the historic pilgrimage route across northern Spain. Harry takes a break after finally reaching the coast. The Way, has been a pilgrimage route since about 300AD that the devout took to visit the grave of the apostle St James or St Iago, the patron saint of Spain who lies buried under the Santiago Cathedral. In olden days the pilgrimage was a form of suffering and penance to assure a pilgrim’s place in heaven. But even as far back as 30BC it had been a supply route for the Roman Seventh Legion based in Astroga and Leon. Nowadays as many as 300,000 modern pilgrims flood the trail for six months of the year, that’s about 50,000 per month, which can make it sound daunting. It turned out to be one of the most diverse and adventurous experiences I’ve had, leaving me inspired and floating in a cloud of contentment. Every step of every day, and I’m talking about 35,000 steps a day, was generally pleasurable. We were advised to have a good pair of sturdy walking boots – one size too big, a good backpack, weighing no more than 10% of one’s body weight when full, and a good poncho. This tip proved very useful to us. The first day’s hike of 32km over the Pyrenees to Roncasvellas in 30-knot headwinds was, thankfully, not an average day and could have been split. By that day’s end we had already met many other peregrinos (Spanish for pilgrim) of all shapes, sizes, backgrounds and ages from all parts of the world. Most of the ones we had met by this stage appeared to be Irish and Korean and were by no means athletes! 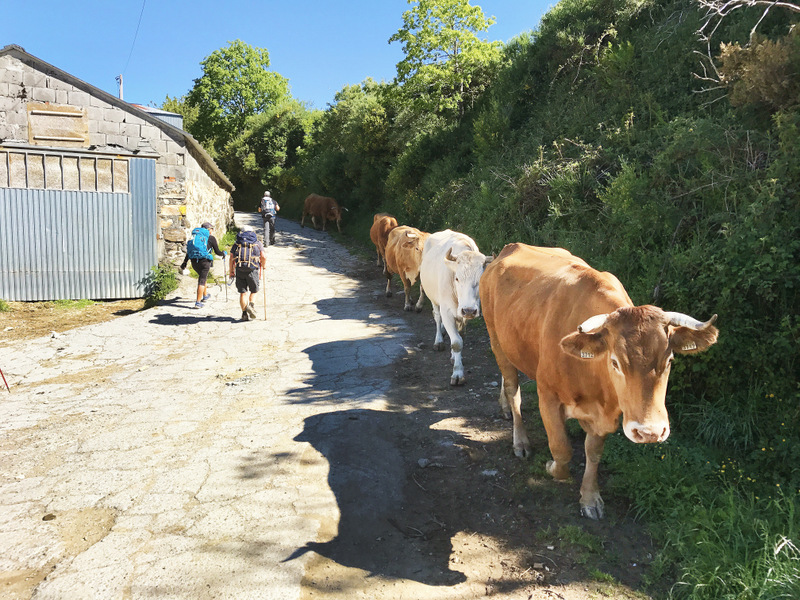 We continued on through Basque country to the vibrant stone-walled city of Pamplona, famous for its running of the bulls festival in July each year. A bust of Ernest Hemingway sits in front of the bull ring in remembrance of his time there and his modernist novel The Sun also Rises. By day seven we had reached Logrono in La Rioja province – famous for its wine and bacon. Our normal daily nomadic routine was to be up and on the trail by 6:30am, before our hosts had even thought about breakfast! A banana and orange would see us through till about 9:30am, where after walking about 15km we’d stop for a hefty bacon and egg breakfast or tortilla with hot café con leche. By 2pm we would be at our destination, allowing us time to find accommodation for the night. The piazzas in the villages and cities are dead until about 7:30pm when suddenly they fill with locals who eat and drink till late. We would normally have the special three-course “Peregrino Dinner” with free-flow local wine for the stately sum of 10 euros and be in bed by 9pm. By day 12 we were in Burgos, the resting place of El Cid, then by day 19 in Leon, both with magnificent gothic cathedrals with high arches reaching towards heaven and large stained glass windows telling the story of Christ in pictures to the villagers who would have been illiterate at the time it was built. Every day, and sometimes every step, brought diverse experiences as we followed meandering paths, rivers and roads. Hats off to the EU, Unesco and the Spanish government for preserving the original trail by linking sections intersected by new highways and railway lines with pedestrian bridges. The trail actually links all of the small villages along The Way and passes all the churches and hospitals where peregrinos stopped, and still do, to either stay or pray or just be inspired by the structures. All the communities along the The Way respect the peregrinos and many locals have walked it themselves. Many peregrinos were soul searching or looking for a partner, and of course, a lot of the conversation revolved round “The Donald”. Most of the single peregrinos banded together into groups and were the best of mates by the end. Pain is something all pilgrims have to endure, but the body adapts to blisters and aches if you let it. Walking becomes like rhythmical breathing and after a while leads to a form of self-hypnosis if you let it. I developed a painful shin splint by day 19, but managed to soldier on! There are many places to eat and sleep listed in the many books, blogs and apps detailing The Way. These range from a floor mat in municipal albergues (inns) for five euros, where bed bugs can be an issue, to private albergues in dormitories of 10 to 100 for 10 euros – though copious snoring and farting can be a problem! We stayed in a few private albergues but mainly small pensions or hostals where a double room costs from 30-50 euro. Some think The Way is over-commercialised with the many new businesses competing to cater for the ever-increasing number of peregrinos. It has, however, been a commercial route since its inception, pilgrims then, as now, needing food and shelter. We had no problem with this, but would recommend walking it sooner rather than later. Surprisingly there was minimal trail rubbish. Everyone should participate in a pilgrimage to remind themselves what we have lost in the modern Western world, especially in the way of camaraderie. Most pilgrims quickly form strong bonds of friendship and acknowledge and smile at strangers, helping each other at every opportunity. After Astroga we climbed into the mist of the highest part of the trip at 1,515m, followed by another mountain crossing from Villa Franca to Tricastella. This can arguably be regarded as the best part. By now we were in Galicia province, home of the Celts and reminiscent of Scotland with its lush rolling mountainous landscapes complete with bagpipes, stone walls and thistles. The pilgrimage has become more than a religious, spiritual or endurance journey – it has morphed into a combination of many different journeys that can combine aspects of history, architecture, food, wine, birds, plants, forestry and agriculture. 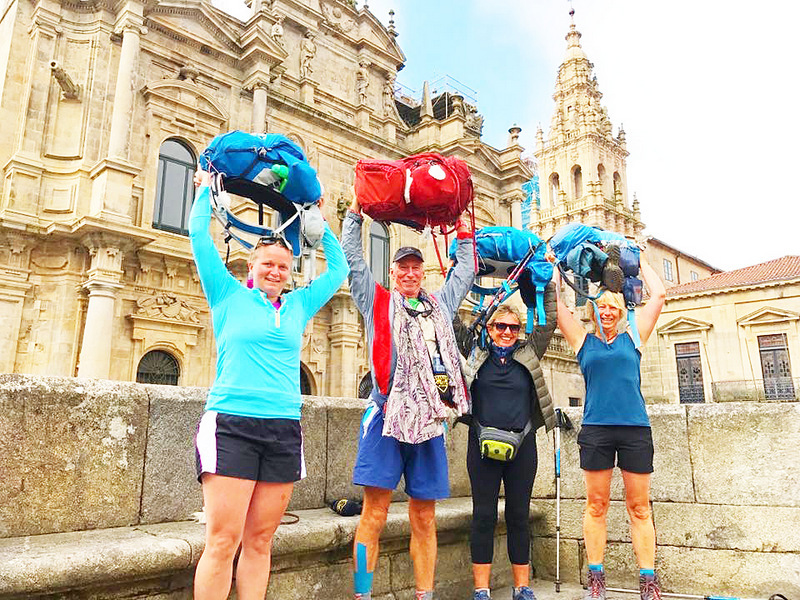 After 34 days of continuous walking we arrived in Santiago and attended the packed pilgrim mass in the Cathedral of Santiago de Compostela, which ended with the swinging of the long incense bowl almost the entire length of two knaves and a few feet from our heads. From Santiago, we caught a bus to Muxia then walked down the coast via Lires to Finisterre. On the second day I followed the green arrows of the longer and more dangerous Camino de Faros (lighthouses) following the rugged coastline. The 10:30pm sunset from the Finisterre lighthouse was the end of our physical journey – we could not walk any further! I felt like a druid worshipping the sunset. I could have done a Forest Gump and kept going – next time! So what had I learned? I was reminded of the Confucian proverb that “more is less” as I was very happy in my simple pilgrim existence, with my few possessions on my back and my inspired and refreshed mind open to the beauty of this ancient journey. Harry Usher is a long-time expat resident of Phuket and co-founder of Lady Pie Bakery and Restaurant in Cherng Talay.